This flight is our most popular scenic tour. As the aircraft flies over the coastal area there are ample opportunities to see sharks, rays and turtles, perhaps even humpback whales and whale sharks in season, as well as the famous elusive dugongs which feed on the marine kelp forests. 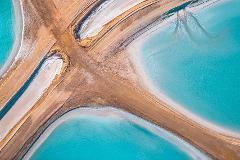 This flight crosses Freycinet Reach to the fascinating patchwork of salt ponds at Useless Loop. It then crosses the sandy finger of Bellefin Prong and out over the rugged Zuytdorp Cliffs. Following the cliffs northward to Australia's most westerly landfall at Steep Point which is separated from historic Dirk Hartog Island by the waters of South Passage passengers can observe a wide range of geological and marine formations which have contributed greatly to the areas popularity. There are ample opportunities to see sharks, rays and turtles, perhaps even whales in season, as well as the shy elusive dugongs. This flight crosses Freycinet Reach to the fascinating patchwork of salt ponds at Useless Loop, then across the sandy finger of Bellefin Prong and out over the rugged Zuytdorp Cliffs following the cliffs northward to Australia's most westerly landfall at Steep Point which is separated from historic Dirk Hartog Island by the waters of South Passage. This flight takes us out past the township of Denham the flight crosses Freycinet Reach to Useless Loop. you will see the stunning Zuytdorp Cliffs and Steep Point which is the most westerly point of Australia, as well as Dirk Hartog Island We search the shallow waters and amongst the seagrass beds for marine life that may include turtles, dolphins, dugongs, sharks or manta rays. 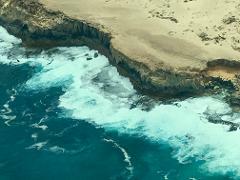 The flight continues past Surf Point and the western coast of Dirk Hartog Island National Park to historic Cape Inscription, along famous Turtle Bay and to the tip Francois Peron National Park. This flight path allows an excellent opportunity to spot humpback whales and whale sharks in season before crossing to Cape Peron North and Skipjack Point, another area noted for its marine life. Next we cross Francois Peron National Park to the famous Big Lagoon and Cape Lesueur. 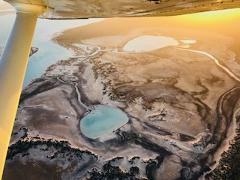 The flight then deviates over Peron homestead and before returning to Shark Bay Airport. This flight takes you across Peron National Park, the Monkey Mia Nature Reserve and Faure Island then on to Hamelin Pool. From Hamelin Pool the flight heads to the southern end of Freycinet reach then on to Useless Loop salt mine. 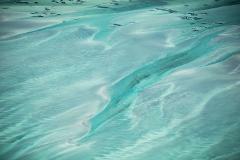 On the way back to Shark Bay you will observe the Denham township. This flight really allows you to appreciate the tranquility of Shark Bay and is a great opportunity to take some stunning photographs.